A good, extra security measure to protect your Facebook account is to enable Login Approvals, to prevent easy logins from unknown devices. Whenever you try to log into your Facebook account from a new web browser (or after clearing your cookies), or just haven't logged in from that particular computer in a while, you'll see this message: "You've asked us to require a 6-digit login code when anyone tries to access your account from a new device or browser". A code is generated periodically by the mobile Facebook app's "Code Generator". 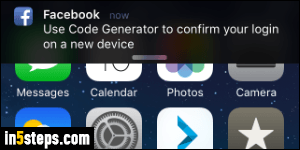 If you pull your phone shortly after seeing the screen shown in the previous screenshot, you'll see a notification by the Facebook app to "Use Code Generator to confirm your login on a new device". Tap on that notification to go straight to Code Generator. Otherwise, open the Facebook app, tap on the "hamburger" icon (three horizontal bars - in one of the corners, typically). Scroll to the bottom and tap on Code Generator. The Code Generator screen shows you a new code every 30 seconds. 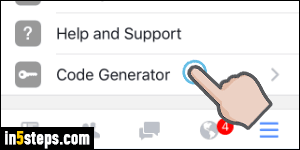 Copy the code exactly as it appears on your iPhone or Android phone / tablet, into the text box on Facebook.com - double-check it and click Continue. 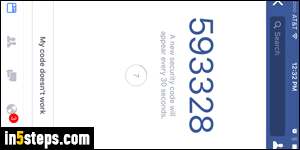 Assuming you've entered the correct code, you'll see the page shown on the screenshot. If you are using this web browser regularly, and it is your own computer or device, keep "Save Browser" selected. 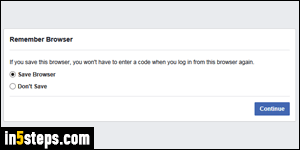 This means that Facebook won't ask you for a login code from it any longer. If it's a one-time login, select "Don't Save" instead. Either way, click Continue once more - you're done!